4 pieces. Fried vegetarian rolls served with sweet chili sauce. Vegetarian. Steamed and stuffed vegetable dumpling served with sweet soy sauce. Vegetarian. 3 pieces. Combination of chicken, potatoes and onions with curry powder in a puff pastry. Served with a cucumber sauce. Steamed shrimp dumpling served with sweet black soy sauce. Roasted duck, scallion cucumbers,carrots and hoisin sauce wrapped in a roti bread. The Massam Curry and Roti recipe has changed and no longer is served like a curry broth but rather a cool curry potato mash. All our other food was fantastic but I wish they updated their photographs to indicate the preparation style. Unfortunately, I will no order this dish anymore in the new style of preparation. Great tasty food. The staff and owner is especially nice as I requested a specific change to my order that wasnt done once I received my delivery. It was minor so I decided not to call and complain, minutes later I had a new meal at the door with the request that I had asked for. Thanks Thai soup. This is my favorite Thai spot in the city. Their duck roll is very tasty. My boyfriend loves that "spicy" means sweat-inducing. I like medium, myself. I didn't have the salmon soup but he said it was awesome. 5 pieces of salmon is really good value. My favorite thing? They cook the tofu perfectly. I've gotten food from here a few times and it's always great. Can be pricey but its always worth it. The location is really small and the waiting area is always filled with supplies - it's hard to stand in there. I always order ahead to avoid having to hang out longer then 3mins. Let's me tell you abt the real story from last night. I do not like to do this much but if that person not telling the true whole story. I have to stand out for it. I do understand that you were so upset from last night that my delivery guy switched the food and send it to another customer by accident. I do apologize for that. At the same time you give me a call and asking abt ur order. I have 1 customer give me a call 1 mins right before you said they got somebody food and he claimed that he didn't open yet coz the receipt is attached on the order. Right away I called to my delivery guys to let him know abt it. He's heading back to pick up the food and resend for you. After that I give you a called to let you know abt it with my professional service. When you pick it up the phone you said you not trust the food from the customer no matter he claimed that he didn't open. I offer you to make a new one and resend it again. You denied it coz you said you not trust my word that am going to make a new one for you. Then you request a refund and asking when will you get the money back. I said it's going to take a few business day.! After I request the refund for her. It's the weekend!!!!!!!! Are you sure I didn't say sorry at all. I went to school too. Delivery is pretty quick which I like about this place. The delivery guy is lazy though and doesnt even buzz my apt. He doesnt even come inside the gate, let alone up to my apt. He calls and expects you to not only go downstairs and get your food, but to go outside because he cant be bothered to come to the door. Pure laziness. Definitely tipping less next time. The food is always fresh. The scallion pancakes are really delicious and have a crunch to them! This is why I keep ordering from them. This place is sooooo delicious. Compared to the average uptown Asian food delivery, this is so far above and out of their league, it's not even funny. Well-balanced flavors. Fresh tasting. Not greasy. Crispy, delicate, delicious. Not as spicy as some Thai, though. Harlemites who are used to throwing hot sauce on everything should ask for it extra spicy. Thai Soup is our go-to Thai place in the area. Coming from Sydney I've been spoiled for choice when it comes to southeast Asian cuisines. NYC Thai has generally been a bit of a let down in comparison, but Thai Soup stand as a solid option in the area, and we've ordered from there reliably over half a dozen times. Would love a choo chee on the menu! We've ordered from this place probably a dozen times and it's definitely our vote for the best takeout place in East Harlem. We ordered today and we got a delivery text 7 minutes after we placed the order. That's insane. That's faster than I could actually make the dish and they delivered it. The food is amazing to boot every time. 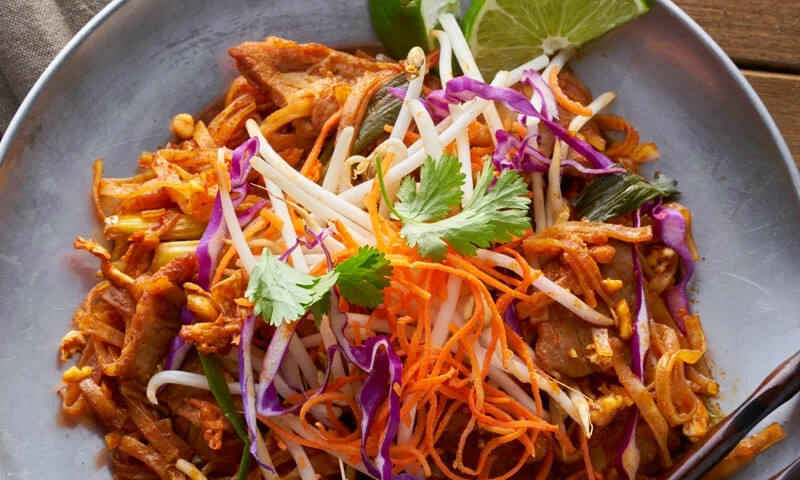 Whether you're craving a quick bite or looking to treat yourself to a delicious meal, you can now order your Thai Soup favorites for takeout or delivery.